They say you never get a second chance to make a first impression and the driveways and footpaths to the front of your home are one of the first things that visitors see on the way to your front door. That’s why we get so many visitors to this website looking for a quotation for driveways or patios. Often, when new properties are first constructed, little thought – and even less money – goes into the surfacing products used for driveways and most will consist of basic black tarmac with a simple border or the cheapest block paving driveways available. 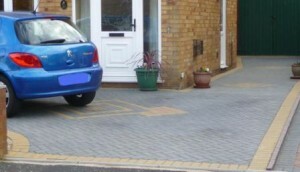 The parking space provided on driveways will often be the bare minimum to satisfy planning and building regulations and will take no account of the needs of two and three car families, which are the norm today. As a home owner you have an ideal opportunity to improve the frontage of your property by using more attractive materials in the design of new driveways. You can add shape and style to what may have been purely functional straight driveways by adding curves to complement and integrate with your front garden. You may require additional car parking spaces or a turning area and in planning new driveways you should consider both the practical and aesthetic aspects. The creation of a patio area to the rear of your home will provide a space to sit out in the privacy of your garden and enjoy the fruits of your labour in what – hopefully – will be warm weather. 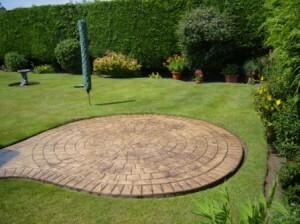 Patio areas can be complimentary to driveways but different materials can also be used to great effect. A patio area should typically be no more than about a third of your total rear garden area but hard landscaping should always be the first thing to be completed if you are intending to give your rear garden a total makeover. If you are having a conservatory built on your home it would be an ideal time to include a patio area adjacent to it. And if your garden drops away from the house or is elevated, you can arrange for retaining walls and steps in matching materials to be constructed at the same time as the conservatory base works. As with all types of home improvements these days there seems to be a never ending, and increasing choice of materials available for driveways and patios. Manufacturers are always looking to widen their product ranges for consumers whilst attempting to make their artificial products more authentic such as concrete surfaces made to look like granite setts or timber boards. Increasingly, permeable driveways are required to help alleviate the potential problems of flooding and both permeable tarmacadam and permeable block paving are now available. The many different types of surfacing for paving driveways and patios include tarmacadam, block paving, pattern imprinted concrete and resin & aggregate surfaces. Quite often, a mixture of different product colours and textures create more attractive driveways or patio areas. For example, basic black tarmacadam driveways can be easily enhanced with a block paving border or feature design built in to the surface. Loose products such as gravel, aggregates and shredded tree bark can be used to blur and soften the boundaries between hard surfaced driveways or patios and the soft planting area of a garden or border. It is becoming increasingly important to properly consider drainage requirements for new driveways, especially in light of Sustainable Urban Drainage Systems (SUDS) legislation. The conversion of soft planting areas into impermeable parking surfaces and driveways to the front of properties is now subject to new regulations introduced to reduce the possibility of localised flooding in urban areas. Just a Quote driveway installers can help you to design attractive new driveways which also takes account of such practical considerations and avoid potential fines for non-compliance with SUDS legislation. Whether you are designing a new driveway to the front of your home or a patio area to the rear, an integrated design is required to ensure that the features of the house and surrounding land are sympathetic to each other. When you are looking for a driveway quote or a patio quote, too much choice can cause confusion. When you invite a sales representative into your home to quote for a new driveway or patio area, you may be impressed by the level of knowledge they have and the care that goes into the design. What you will not get though is objective, un-biased advice because for all of the friendliness and empathy the sales representative imparts, they are there for one purpose only – to sell his company’s products, at the highest price he can get away with! Just a Quote will introduce you to up to four qualified and experienced driveways installation companies who will carry out a detailed survey and provide a free quotation. During the survey they will listen to your requirements, show you sample products or brochures and discuss the many options which are available. There are fewer industries that have been criticised in the way that the home improvement industry has been in the United Kingdom. The stereotypical ‘double glazing salesman’ is disliked and ridiculed along with tax inspectors and second hand car salesmen, and sometimes for very good reason. Most home owners have heard stories of dubious sales techniques; false discounts, poor quality installations and non-existent after-sales service. And the statistics don’t help either. In the year to March 2011 Consumer Direct received approximately 85,000 complaints regarding home improvements. There are however, some excellent, well-designed products available which are diligently installed by experienced craftsmen who take pride in their work and who are employed by companies which genuinely do care for their customers. Major advancements have been made in the technology and design of new products over the past few decades which have resulted in a much better offering for customers.